The above is true whether looking at the undesirable outcomes of the question (for example, responses which would indicate poor staffing) or the desirable outcome (for example, adequate staffing all of the time). Several respondents also indicated in their comments that they were leaving or had recently left community pharmacy to work in a GP practice. After the first survey, the PDA wrote to the superintendents of each of the CCA multiples and offered to meet with them about the results. 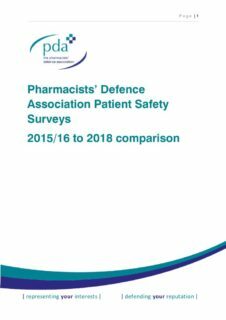 In support of the Safer Pharmacies campaigning, the PDA will soon conduct a further patient safety survey and will report on the responses. 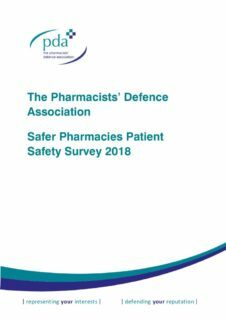 The PDA will call on pharmacists to complete the survey and will continue to monitor the situation. From the 2018 survey, the community and hospital sectors of practice could also be compared. The figures in the table are percentages in the format “% All of the time / % around half the time or less”, reflecting the extent to which respondents said the commitments had been met by their employer within the past six months. 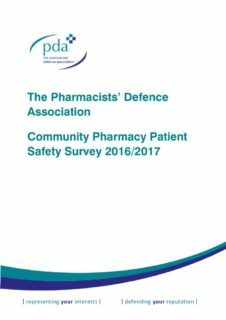 For each of the principles in the Safer Pharmacies Charter, hospital pharmacy fared considerably better than community pharmacy. The above points are true whether looking at the undesirable outcomes of the question (for example, responses which would indicate poor staffing) or the desirable outcome (for example, adequate staffing all of the time). As with community pharmacy, the results in the hospital sector are still cause for concern.